Aware with Words supports leaders to build organisations known for their trust, co-creating teams, innovation and employee well-being. We work with current and aspiring leaders. We also work with clients privately - outside the organisational context. Clients come to us because they can't seem to get people to work together in an engaged, results focused way. They may question their communication effectiveness, struggle with challenging feedback or difficult conversations, or have lost their inspiration or sense of direction. Anne has a particular interest in working with leaders in the health sector, media and politics, and sales teams. She also enjoys supporting leaders in less dominant social groups to find their voice and influence. Leadership Coaching: Our clients typically develop a keen awareness about what really matters to them, what keeps them stuck and what needs to change for them to create the relationships, work environments, project outcomes and pace they want. With this new awareness and confidence (and supported as needed) many clients transform their lives and relationships. Communication Coaching: Where communication is the focus of our work, typically the "penny drops" for clients. They discover habits, assumptions and filters that have been holding them back in their communication. Informed by current findings in neuroscience and communication, they learn how to create conversions that build trust, communicating in a way that is authentic, compassionate and focused on the results they want to see. Online or face-to-face we start where you are now, discovering (together with you) your strengths and successes, building on that and discovering where your challenges are. Where applicable we use tools from Conversational Intelligence® to discover how trust and communication effectiveness are perceived across your organisation. We diagnose patterns and behaviours that support your strengths and those contributing to your challenges. We then offer coaching (individually, in teams or small groups) into greater awareness, competency and resilience. Using the latest neuroscience, we show you how to befriend your brain and work with it for the best results! We evaluate our interventions using the baselines we've established at the start of our engagement. Facilitation: Anne is also an experienced facilitator and offers facilitation of meetings where conversations may be difficult and challenging. Her preference is to do this in mindful awareness with clients, so that - where possible - they can grow their own skills in this area. Our work is informed by Judith Glaser's Conversational Intelligence® (C-IQ), Robert Gonzales' Living-Compassion, Marshall Rosenberg and CNVC's Nonviolent Communication, Transformational Coaching (Leadership That Works, NY), Convergent Facilitation, User Experience Design and more. Anne is committed to contributing to a culture where people are fully heard, diversity is harnessed, and processes put in place that enable people to create and meet shared needs together while retaining their own voice and authenticity. We respect the resourcefulness and wisdom of all. We like to support our clients to connect with their core life energy and purpose - in ways that include adventure, playfulness and respect for timelines. Anne has over 25 years experience coaching adults - as a health professional, communications consultant and now as a certified coach. As a Speech Pathologist (her first career), Anne coached adults who struggled with the after effects of acquired brain injury. She used her understanding of language and brain function to support her clients to be their best authentic selves in their unique environment. She did this by raising their awareness of their current communication successes and challenges, and providing new knowledge, skills and practice as needed. Her aim was always to do herself out of a job with them as they regained their independence. Organisational Communication was Anne's next career move. It was a natural path to take with her the communication and coaching principles that she'd used in Speech Pathology. In addition to facilitating difficult meetings, conducting training programs, copywriting and editing, Anne coached leaders and teams to become more effective facilitators and communicators - both in conversation and written communication. This was commonly in the context of organisational change programs. The industries Anne partnered with included mining, metals processing, road safety, health service delivery and building and construction. Anne's personal path: Anne's personal life path has run in parallel to her work. She comes to her current communication and leadership coaching having found her own authentic presence - not only in how she thinks but in connecting to what really "sings'' for her. This has been a rich and crazy path she could never have designed herself and has seen her connect more fully with her heart, intuition and physical presence. 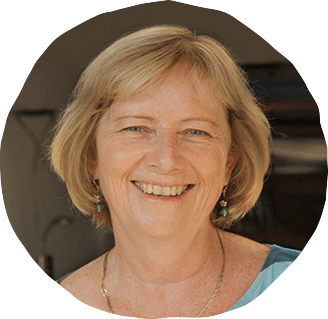 Anne brings to her work with leaders, insights from her own grappling with belief systems, organisations and subcultures where power is not always effectively shared in ways that bring out the best in others. While her path has seen her cease to run to the beat of others' drums at the expense of her own authenticity, it has also opened doors to create richly with others. Undergraduate - Life - ongoing!